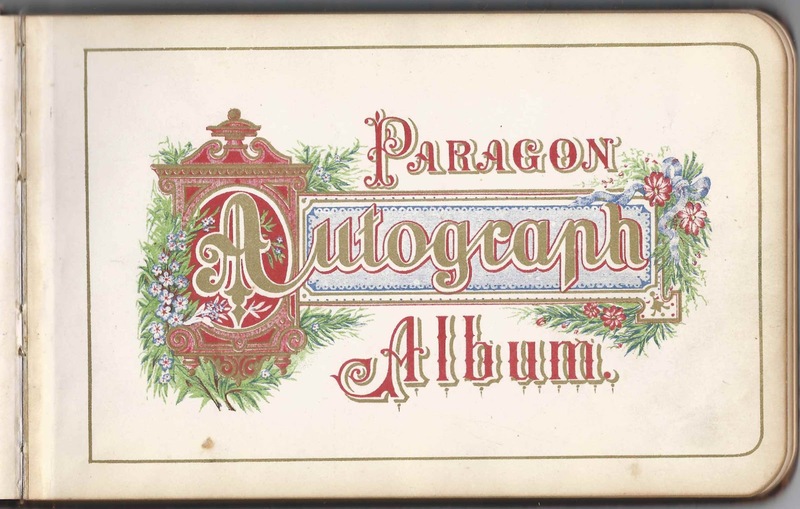 1880-1893 autograph album that belonged to Henry Clinton Monroe of Middleborough, Massachusetts. 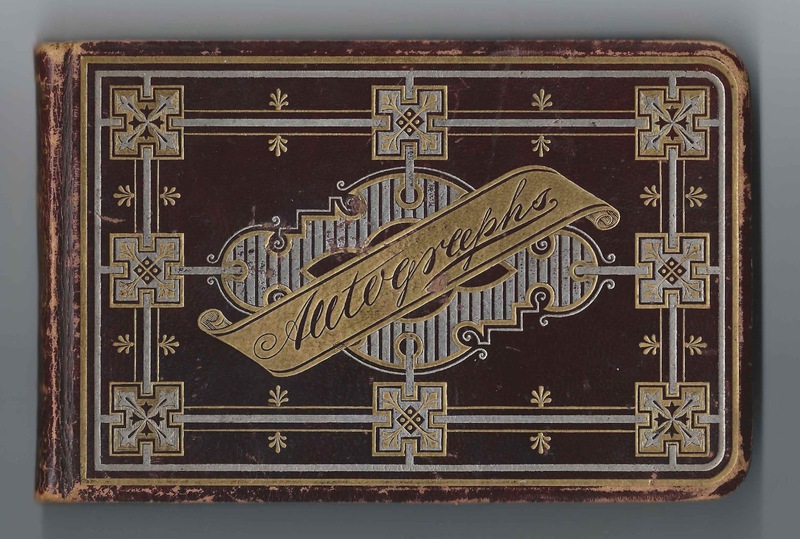 This album was found with a spelling book that was the property of a Miss Martha J. Munroe in 1848. She was born in 1836, the daughter of William and Sophia (Williams) Munroe/Monroe. Martha would later marry George Alfred Dunham. Henry marked his album with his name in two places. 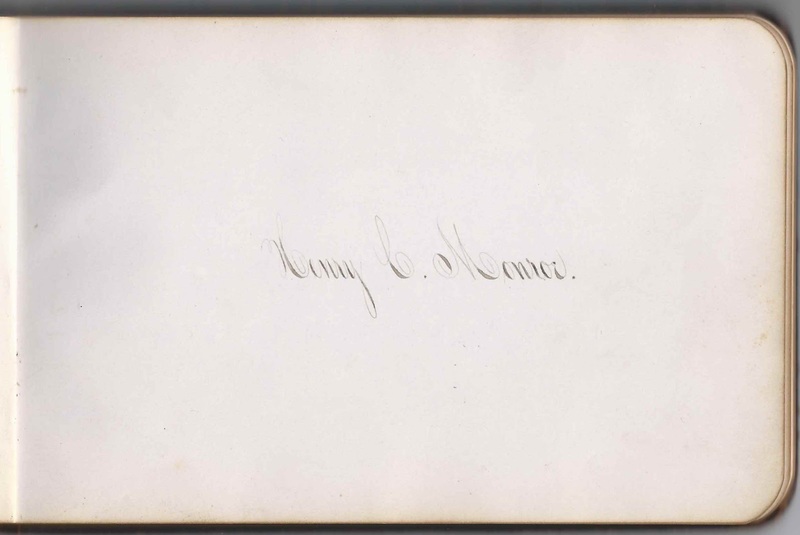 The album is approximately 7-3/4" x 5" and contains the sentiments of 31 of Henry's relatives and friends. An alphabetical surname list and an alphabetical list of the signers, with any personal information, appear at the end of this post. 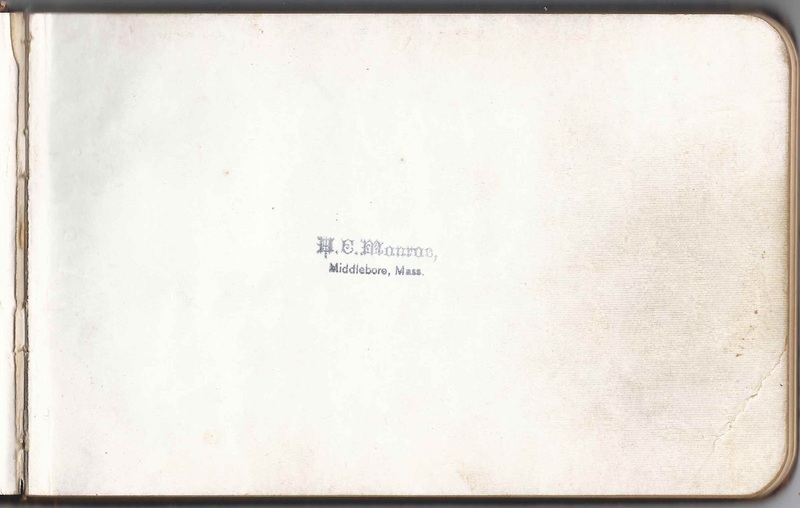 Henry Clinton Monroe was born 18 June 1863 at New Bedford, Massachusetts, the son of Daniel Brainard Monroe and Samantha Luphemia (Tinkham) Monroe. Daniel signed a page in Henry's album on April 17, 1881 at Middleborough, Massachusetts, which he spelled Middleboro. On 15 June 1886 to Alvaretta Thompson, daughter of Judah and Jane B. (Hubbard) Thompson. Alvaretta was born 13 November 1857 at New Haven, Connecticut. She died 25 November 1887 at Middleborough, Massachusetts. On 1 October 1890 at Newton, Massachusetts, to Susan Lucretia Loring, 'Susie", daughter of Edwin P. and Lucy (Warren) Loring. Susie was born 14 September 1861 at Rome Station, Indiana, the daughter of Edwin Phelps Loring and Lucy L. (Warren) Loring. Susie died 3 January 1897. On 23 June 1898 at Lakeville, Massachusetts, to Minnie Church (Leonard) Griffin, widow of Frank A. Griffin. Minnie was born 23 June 1872 at Rochester, Massachusetts, daughter of Stillman Winfield Leonard and Eliza Jane (Davis) Leonard. Henry and Minnie had a daughter Dorothy, born 7 November 1899. I believe Minnie lived until 1944, so apparently she and Henry divorced. On 15 September 1910 at Middleborough, Massachusetts, to Bertha Louise Martis, daughter of Henry Francis Martis and Mary Curtis (Brett) Martis. Bertha was born 19 November 1975 at Brockton, Massachusetts; she died in 1967. Henry Clinton Moore died at some point after the enumeration of the 1940 Census, at which time he and Bertha were living at Brockton, Massachusetts. If you have corrections and/or additions to the information above, or information on any of the signers listed below, please leave a comment or contact me directly. Notice that several of the signers were named Thompson and Loring. E. J. T., signed on November 19, 1884. Perhaps a Thompson or a Tinkham? Luman R. Ashley, signed at Taunton, Massachusetts, on August 6, 1880; named worked into an intricate bird design. Alton W. Crowell, signed on February 5, 1881; his name is worked into an intricate sketch. Herbert B. Gardner of New Bedford, Massachusetts. His wife Corinne H. (Post) Gardner signed the right facing page. Corinne H. Gardner of New Bedford, Massachusetts. She was Corinne H. (Post) Gardner, whose husband Herbert B. Gardner signed the left facing page. 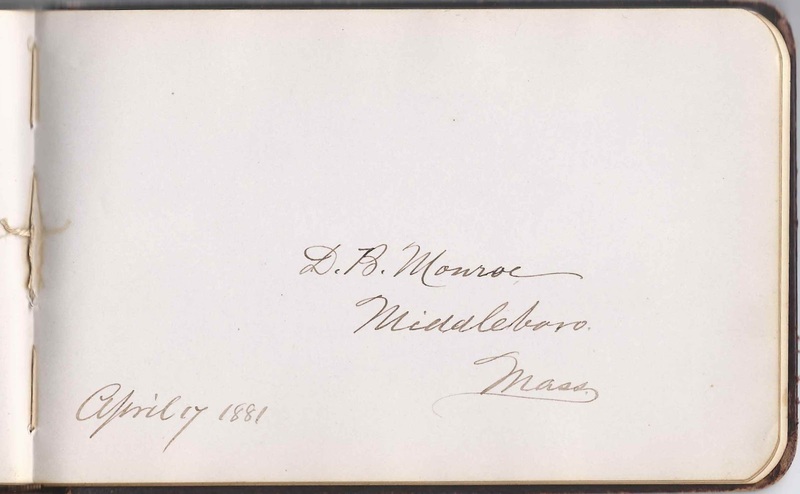 D. B. Monroe of Middleborough, Massachusetts, signed on April 17, 1881. He was David Brainard Monroe, father of Henry Clinton Monroe. Adelia M. Thompson of West Newton, Massachusetts; "Aunt Della".